Strategic deterrence starts with nuclear capabilities because nuclear war always has been an existential threat to the nation, but deterrence in the 21st century presents new challenges and requires the integration of all capabilities, the commander of U.S. Strategic Command said during a recent interview with DoD News at his command's Offutt Air Force Base, Nebraska, headquarters. 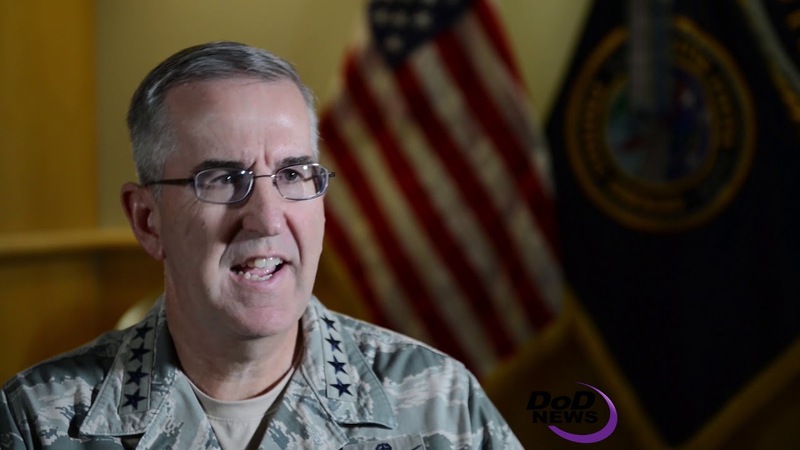 Air Force Gen. John E. Hyten said his three priorities for Stratcom are simple: one, above all else provide a strategic deterrent; two, if deterrence fails provide a decisive response; and three, respond with a combat-ready force. But unlike in past decades, the 21st century presents more than one adversary and more than one domain, he said. "It's now a multipolar problem with many nations that have nuclear weapons, … and it's also multidomain. … We have adversaries that are looking at integrating nuclear, conventional, space and cyber, all as part of a strategic deterrent. We have to think about strategic deterrence in the same way," Hyten said. The vision for Stratcom, he added, is to integrate all capabilities -- nuclear, space, cyberspace, missile defense, global strike, electronic warfare, intelligence, targeting, analysis -- so they can be brought to bear in a single decisive response if the nation is threatened. "We can't [assume] that having 1,550 deployed strategic nuclear weapons under the New START Treaty somehow deters all our adversaries. It doesn't," the general said. "We have to think about all the domains, all the adversaries, all the capabilities, and focus our attention across the board on all of those." Modernization is critical to the future of the U.S. deterrent capability, Hyten said, because all elements of the nuclear triad -- bombers, intercontinental ballistic missiles and nuclear submarines -- will reach a point within about 15 years at which they're no longer viable. "They are viable today. They are safe, secure, reliable, ready, [and] they can do all the missions they need to do today," he said. "But in the not-too-distant future, that won't be the case. Sadly, we've delayed the modernization of those programs really too long. And now if you lay all the modernization programs out on a single table and you look at when they all deliver, they all deliver just in time." The next intercontinental ballistic missile delivers just in time to replace the Minuteman, and the Columbia nuclear submarine delivers just in time to replace the Ohio-class sub, he added. "Any one-year delay in Columbia means the future Stratcom commander is going to be down one submarine. And any future delay in the ICBM means we're going to be down a certain number of ICBMs," Hyten said. It's the same with the nation's B-52 and B-2 bombers, the general said. The B-52 is an old but amazing weapon delivery platform that will have no penetration capability because of evolving penetration profiles. The B-2 is aging out and must be replaced by the B-21. The B-21 will come along just in time to provide the bomber capabilities the nation needs, he added. "I don't want a future Stratcom commander to ever face a day where we don't have a safe, secure, ready and reliable nuclear deterrent," he said. "It has to be there." Extended deterrence is another critical job for Stratcom, Hyten said, noting that assurance is one of the most important things the command does for U.S. allies. "When you look at our allies like the Republic of Korea or Japan, we have capabilities here that provide an extended deterrent for those two allies and a number of other allies around the world," he said. "It's important that the United States always assure them that we will be there with the capabilities that we have if they're ever attacked with nuclear capabilities. That's what extended deterrence means." Assurance can come through demonstrations, partnerships and exercises, he noted. "There is a challenge right now with North Korea, and it's very important for the Republic of Korea and for Japan to know that we will be there. And we will be," he said. Stratcom's strength lies with the 184,000 people who show up and do Stratcom business every day, Hyten said. "The best part of being a commander is actually seeing the young men and women who do this mission every day," the general said. "The soldiers, sailors, airmen and Marines sign up to do some of the most difficult jobs that our country has, and man, they do it, they love it and they're good at it." Hyten said he can't emphasize the importance of Stratcom's people enough. "Sometimes it brings tears to your eyes when you see the quality of the people who come, who raise their hand and want to come and serve our country," he added. The general said he loves the fact that Stratcom's people raise their hands and swear an oath to support and defend the U.S. Constitution, an ideal written down on a piece of paper more than 200 years ago. That ideal still is what drives men and women of the nation to want to serve, he added. "The people of this command take that very seriously," Hyten said, "and they are just remarkable in what they do."